60 well furnished apartments in an excellent central Prague location, right on Wenceslas Square. Bars, clubs, shops and restaurants are right out your door. Choose from a studio, one, two and three-bedroom apartments, all with lounge/dining areas and fully equipped kitchens and modern bathrooms. 13 brand new, modern air-conditioned apartments in an excellent central Prague location, right on Wenceslas Square. These 3* superior apartments are situated on the top floor of a modern six-storey building, each has its own terrace. The apartments accommodate up to 4 people and come with lounge/dining areas, kitchenettes and modern bathrooms. 10 well furnished apartments in an excellent central Prague location, right on Wenceslas Square. Bars, clubs, shops and restaurants are right out your door. Choose from one, two and three-bedroom apartments, all with lounge/dining areas and fully equipped kitchens and modern bathrooms. 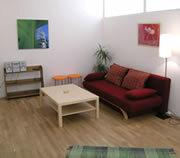 7 excellent apartments in the centre of Prague, just a few minutes walk from Wenceslas Square and the Old Town Square. 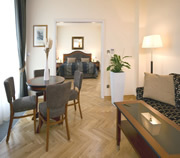 The 4* Prague Central Apartments are modern, stylish and very spacious. Choose from one, two, three and four-bedroom apartments, with lounge/dining areas, fully equipped kitchens and modern bathrooms. 13 brand new, luxury and simply stunning air-conditioned apartments in an excellent location right on Wenceslas Square. These 4* superior apartments are on the 6th floor of an ultra modern glass fronted building. Choose from studio and one-bedroom apartments. Some have terraces with views of Wenceslas Square and Prague Castle. 15 luxurious air-conditioned apartments in an excellent central Prague location, right on Wenceslas Square. 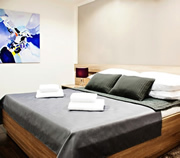 The 4* superior Wenceslas Square Elysee Apartments are very spacious, and equipped with high quality Italian furniture. All apartments are one-bedroom, with lounge/dining areas, fully equipped kitchens and modern bathrooms.